I’ve never considered this as an insult, although I’m sure it was flung at me like an insult over my life. My mom’s birthday is today, and I see her often enough where I didn’t have to be reminded of what an amazing person she is. 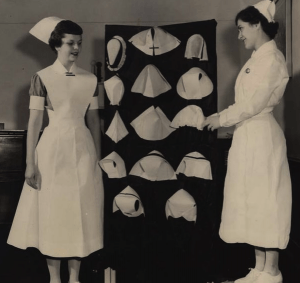 She always did well in school and ended becoming a Registered Nurse back in the day when you still had to iron and starch your own caps. 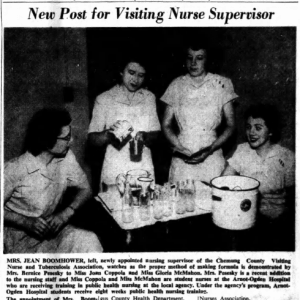 Neither of those two is my mom, but here’s a newspaper photo of her learning how to make formula correctly during her nursing school days. She would go on to use this skill as she ended up having seven children. Turns out my mom has the original of this photo somewhere that she got from the newspaper photographer in Elmira, NY. It was so awesome to hear about each of the people in this photograph and stories about upcoming weddings and how she ended up with the wedding dress in which she got married. Love that oral history of my family. What I found most amazing about my mom was that when my dad died at the age of 43, she showed how strong she could be and kept us together as a family, despite grief, financial worries and children that weren\’t always the most grateful. We all had the opportunity to go to college without getting ourselves into debt. I honestly don\’t know how she did it. But I could be biased…you know how gay boys are about their mothers. So yes, I am a mama\’s boy. 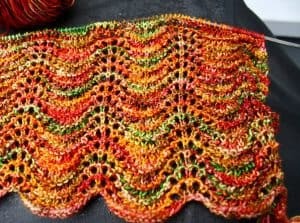 When I\’ve got three W\’sIP on the needles, I thought it was easier working on the one project that requires keeping track of which row I\’m on. 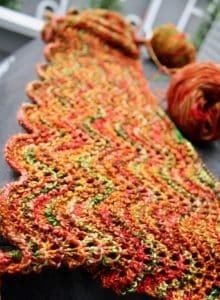 The Old Shale Wrap in bright Autumnal colors is turning out beautifully…no? The next two projects I finish already have people interested in buying them, so hopefully I already have two pre-sales before my December 2nd Fine Craft Show.